Okay. I have a MySpace space. I've never really been able to figure out what to do with it. But some kind friend sent me an invitation to a NEW thing where I fit RIGHT in. It's called SHELFARI. I guess as a sorta pun on Safari--I dunno. But it's a place where you can list the books you've read, state your opinions on them, and find other people who like to read the same kinds of things you like. And make friends with them. And stuff. It's GREAT! So, yeah. I'm not writing. I'm trying to pack (put all the "essential" family pictures in a box this a.m. along with the essential cookbooks and the research books--and then actually managed to carry it out to the garage). Trying to keep things neat-ish. The real estate agent and a MLS guy came by today to measure everything. I'd been told they would come take pictures--I took some pictures last night, not including my still messy office--and copied them onto a CD, which I gave the agent. And they didn't take any more pictures, so I guess they'll use the ones I took. Hope somebody buys this house soon. It's only 2 bedrooms, for all the size it has, so it may take a while. Eww. Just occurred to me--it's REALLY humid on the coast, which is not good for books. I'll have to find a place for my comics in the house--or sell them all on e-Bay. I miss them, but don't have time for them any more. Especially won't if I have to get a dayjob, which is a possibility. Next writing project, to be started in the new house/town--I'm going to revise the demon hunter book and see if I can get over the first barrier. Then I'm going to start the re-write on the urban fantasy Irish shaman/Navajo warrior princess story. Oh, and I'm still writing 25 pages a month on the WWII story, Thunder. Um--I've finished the new Harry Potter book. I was out of town when the mail order package came in, but I read it. It was a satisfying ending to the story, I thought. I've also read an old Barbara Delinsky, Looking for Peyton Place, which I liked, and Liz Maverick's launch of the Shomi line, Wired, which I think I liked, but it confused me a lot, so I'm not really sure. On the airplane coming back, I read Karma Girl by Jennifer Estep (liked it) and Soul Song by Marjorie M. Liu (liked it too). Need to sort my ABRs (already been read) into keepers, library donations and trade-ins. I haven't lived near Waco in 8 years, but I'm still carting my trade-ins to Golden's Books on Franklin street there--best used book store I've found so far. Maybe I'll find a new one in the new place, but will wait and see. Oh! I did get my domain up and running again. (It helps when you pay your bills on time. ) Now to update it. And then, to shift my plan. I have it on one that isn't particularly idiot-friendly. I need something for the computerly ignorant. Something has hit the fan. We shall not endeavor to figure out what the substance is. But it is not pleasant. I have been on airplanes, and spent the night in a place other than home without my suitcase. The trip started off good, but the ending? Not so much. Went to the island to look at places to live. Spent 3 days doing it, looked at so many houses they started to blur together, and we have a place--or will in a couple of weeks when we hook up the U-Haul and head down to live in it. There is a great big deck. With a roof over it, so one can sit on the deck and admire the rain falling. It rained while we were looking on it. This is something of a temporary solution, but I think we'll probably be here at least a year, so not that temporary. We went walking on the Seawall one evening. It was fairly cool, and as long as the offshore breeze could reach me, it was pleasant, but it was so humid, when the buildings blocked the breeze, it got really hot. It's going to take me a while to get used to the humidity, coming from West Texas, where there isn't any. The fella is currently staying in a little beach shack, even though it's about six blocks from the beach (sounds close, but it isn't) that really is a shack. The boards flooring the porch are a little too flexible, and a few are missing their ends. It has one living area, a bedroom with a twin bed, a bathroom and a little kitchen. It's liveable, but not really comfortable. The futon we slept on had to be the most uncomfortable thing I've slept on since the floor. But it was good enough for a weekend visit. We changed my flight to later on Sunday so I could stay a while longer and look at a couple more houses--and when I got to the gate at the airport in Houston, the flight was delayed about 45 minutes--but my connecting flight was delayed too. Then, when it finally arrived and they let us get on the plane, a thunderstorm had moved in and they shut down the ramp, brought all the baggage handlers and such inside. Which was a good thing. I didn't want them fueling the airplane in the lightning either. But that meant I missed my connection in Dallas (the whole world connects in Dallas--if they're not connecting through Atlanta). I could get off the plane, have the fella drive back into town and get me, or I could go on to Dallas and stay with relatives, and no suitcase. I went to Dallas. They had a toothbrush for me and a pair of clean underwear (a girl has to keep her priorities straight!) --(I will not return the underwear. I'm buying a new pair for her) and a bed to sleep in. And finally, a day and a half late, I am home again. I am having domain crises, so yes, the website is down at the worst possible time, when the book is due out at any time. I will try to get it back up asap--but I'm not sure how long that will take, especially since I'm feeling poor. We will just have to see. Oh, and I got to watch pelicans fishing. They are such huge birds in the air, and they seem to like to fly in straight lines, one behind the other, in groups of three or four. Not in a Vee, in a line. When they were fishing, they would go about 20 feet in the air, then drop like a rock into the water. Big splash, then they'd sit there a while, floating. Don't know if they were swallowing or recovering from the belly flop (that's what it looked like)--I wasn't close enough to really see. But it was totally cool. Can't wait to see it again. Getting the steampunk book revisions in the 'puter this week and printing it out to mail. Hope I get it all together. Have to pack my research books to move... At least we don't have to worry about moving bookcases--this house has lots and lots of builtins. I have written my 25 pages for the week. I wanted to go further, but I wasn't sure where I was heading. The past couple of days, my characters have been walking somewhere--today they arrived, and I am not real sure what needs to happen here. I can figure out some kind of a scene, but what purpose would that scene have? How could it affect the plot? It needs to affect the plot in some way. So, I'm thinking I might do a flashback, use it to explain why my heroine stayed on the island. I've decided on some major revisions, cutting out early scenes, mostly because what I've learned during research doesn't match up with what I had originally plotted. Westerners were actually in less danger than Chinese in Japanese-occupied territory during WWII, even out of China, even those from nations at war with Japan. At least somewhat. And the plantation society was primarily male, so there weren't many children needing teaching. Schools mostly came through the missions. And all this means major tweaking, especially to my motivations. Major plot events don't have to change, but the hows and the whys will, and I don't know exactly what those are going to be. So I guess I'll have to think about that over the weekend. I have been scolded for not getting a post up. It's not my fault--or not so much. I've been away. And I'm about to go away again. But I'm here now and so I shall attempt to get up a quick post. Then their granddaddy left town to go start his new job. (For some reason he thought that was important.) That wasn't so bad, but then the son--the little boys' daddy--didn't make it to town till about a day later than we'd hoped. (Me and the little guys.) We did fine, but we sure were glad to see their daddy. Then I took them all home, and drove down to Austin to see the parents and the sister & B-i-L who were down from the far northland to see my niece graduate from Air Force bootcamp. That was an adventure and a half, but we don't want to make this blogpost too long. 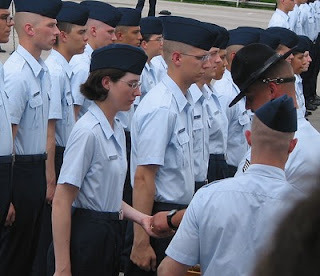 The picture here is of the niece getting her Coin the day before the official graduation. She was an honor grad, but I blurred most of those pictures. (sigh) Anyway, it was a lot of fun to get to go and see all the ceremony, where she lived, all that stuff, and to visit with the family. I took Mama & Daddy home before the rest of them came back up, because they couldn't keep up too well with all the "young folks." We had a nice time shopping and "resting up." Then it was time to go to Dallas for RWA. That was an experience and a half. And I took Absolutely NO pictures while I was at conference. I don't know why, except that I just didn't feel like dragging the camera around. So I didn't. I didn't even get a picture of me with my Prism award. Yeah, I won the Prism Award in the fantasy category, which is a pretty nifty and well-respected award for fantasy and paranormal (like vampires and stuff) romance, presented by the Fantasy, Futuristic and Paranormal chapter of RWA, for The Barbed Rose. I'll write more about conference when I recover a little more. I danced a lot at the Harlequin party, and I'm still sore from that. A few of us tried to teach all the Yankees about the Cotton-eyed Joe, but I'm not sure how well it worked. Oh well. And then there was all the REST of the dancing. I intend to post at least one more blog before I head down to the island for the weekend to look at houses. We shall see if I make it. I'm trying to write 25 pages on the World War II novel (working title: Thunder in a Cloudless Sky--because that's what artillery firing sounds like...) by Saturday this week, so I can earn this month's charm. It's 25 pages for the month, and I haven't written anything at all so far this month. (First boys, then out of town.) It's looking pretty good. I'm up to 16.5 so far. Of course, I haven't done a THING toward moving... except unpack the suitcases and divvy up the give-away books from conference. Okay, done. I'm ending this too-long blog. Really. Now. I'm quitting.